Montpellier fly-half Francois Trinh-Duc believes that winning the Top 14 would represent a bigger achievement than claiming a Six Nations Grand Slam with France. The 24-year-old playmaker, capped 27 times by Les Bleus, is gearing up for Saturday's final against 17-time champions Toulouse, who are the overwhelming favourites to lift a first title since 2008. Trinh-Duc believes in his team-mates however, having seen them dump Castres and Racing Metro, who finished the league season in second place, out in the play-off stages. 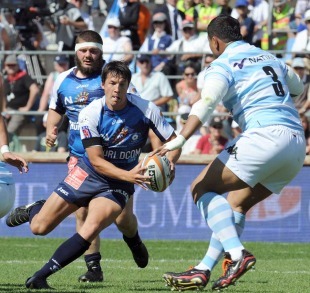 "To experience this with your club, this Montpellier side, heaps on the emotion," he told AFP. "There is the rugby adventure that everyone has witnessed which is exceptional in itself. "But behind the scenes, there is the human element involving meeting wonderful people inside the club and the ups and downs which we have experienced which makes it even more emotional. It is more significant what I am experiencing with Montpellier than with the France side." Montpellier have made the play-offs for the first time in their young history this season, having undergone a revival under the stewardship of coaches Fabien Galthie and Eric Bechu. "Our mental approach had always been very good, there was an excellent spirit here even though we flirted with relegation last season," Trinh-Duc said. "But they introduced an ambitious game plan, a routine which allowed us to work both individually and collectively in terms of discipline, the strategy, the nitty gritty. Now we are more proactive."